for everyone, from the beginner to the experienced geek. POP email servers are not as smart as IMAP, Exchange or online email services. They are unable to keep track of what mail you have already downloaded, when you are moving between computers or when you have just reinstalled Outlook (if you have imported a backup). This is not normally a problem in day to day use, but when you do make changes to your email account settings, you can end up with duplicate items, and a lot of them. It is a real hassle to remove each of these duplicate items individually, and in the past I have manually removed them. Today after a fresh install of Outlook, I had around 150 duplicate items! I needed to find a better way to automate the removal of these. I came across a number of utilities that would do the job. Some of them are free and others are commercial or shareware releases. 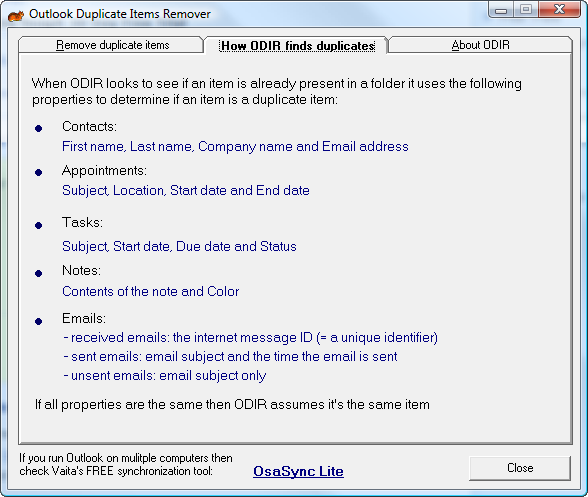 After a bit of testing Outlook Duplicate Items Remover (ODIR) came out on top. 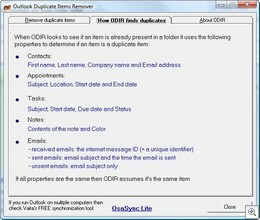 ODIR scans your Outlook mail, contacts, tasks and calendar for duplicate items. If an item is found to be a duplicate it moves the item into a folder called ODIR Duplicate Items. You can then look through this folder and then delete it’s contents once you are comfortable that you don’t need any of them. There are a number of reasons I preferred ODIR over the other utilities I tested out. First of all, it is free which is always a big selling point for me. ODIR had fewer options than many of the others, but in the end I felt most comfortable using it as it did not automatically delete duplicate items (as most of the others did). Instead, ODIR moved them into a separate directory which I could quickly sift through to confirm that no legitimate mail was removed. If you find yourself in the same situation, do yourself a favour and download ODIR. It is so quick and easy to use, making this huge hassle a piece of cake. ODIR is available for free from Vaita. Tested on Outlook 2007 in Vista. Hi Paul, is there anything stopping you from using a normal microphone and PC speakers instead of the headset? I may have missed the point. I have played with this type of thing before. I came up with the solution of adding a voice/fax modem into the mix. Using the audio ports of the modem, I was able to send the output of the modem into the line in of the computer, and an audio output of the computer into the microphone input of the modem.